Broussard described how the man, Odell Roberson, started to run when he saw Broussard come at him with a shotgun in summer 2007. “I said, ‘Stop or I’m going to fire,'” Broussard said, before bursting into laughter, then turning his head and stifling his laughs into his arm. Broussard is on the witness stand for the second day in the triple-murder trial of Your Black Muslim Bakery leader Yusuf Bey IV and bakery member Antoine Mackey. 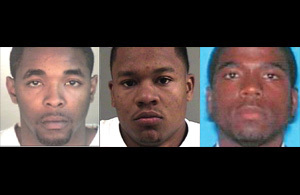 Broussard said he killed Roberson and a second man, journalist Chauncey Bailey, at Bey IV’s order; Mackey is charged with helping in both those killings and with the murder or a third man, Michael Wills. Bey IV and Mackey, both 25, have pleaded not guilty. Broussard is the prosecution’s star witness in the case. He has pleaded guilty to killing Roberson and Bailey and will receive a 25-year sentence in exchange for his testimony. After describing the Roberson killing, Broussard, 23, briefly told jurors how Mackey bragged about killing Wills. Mackey and Bey IV, Broussard said, also mocked that killing, laughing together about how Wills’ leg flew into the air when he was shot, as if kicking a football. Broussard said they jumped around imitating a football referee, raising their arms in the air and saying, “It’s good, it’s good,” as if referring to a touchdown kick. In earlier testimony, Broussard said Bey IV wanted Roberson dead in what Broussard called “an eye for an eye” philosophy practiced at the bakery. “He said, ‘Take him out when you get the chance,'” Broussard told the jury. Broussard seemed far calmer on the witness stand than he did Thursday, when he stumbled through testimony and said he lacked the words to answer prosecutor Melissa Krum’s questions. Bey IV’s older brother, Antar Bey, was shot dead at a North Oakland gas station in October 2005. A man named Alfonza Phillips was later convicted. Broussard told jurors Monday that Bey IV’s first intended victim was Phillips’ father, Alfonza Phillips Sr.
“He wanted me, when I got the opportunity, to kill him,” Broussard said. Bey IV pointed out Phillip Sr. when he, Broussard and others attended the younger Phillips’ court appearances. But the elder Phillips proved elusive when Broussard, and eventually, Mackey, staked out his house and tried to learn his schedule, Broussard testified. In early July 2007, Broussard said he and Bey IV were at the bakery when Roberson — the younger Phillips’ uncle — wandered past. Bey IV said, “‘You know who he is?” Broussard said, adding he didn’t have an answer. “He’s related to the dude who killed my brother,” he quoted Bey IV as saying. Bey IV responded, “‘That’s why we need more brothers like you,” Broussard said. Then Bey IV told him to track Roberson’s movements around the San Pablo Avenue neighborhood where the bakery was located. But Bey IV quickly wanted Roberson killed because he was an easier target to locate that Phillips Sr., Broussard said as jurors watched. Near the end of the morning testimony, Broussard began to describe the night he killed Roberson. When he said Mackey left the bakery compound with him and carried an SKS assault rifle with a folding stock, he looked directly at Mackey, who was seated at the defense table wearing a white shirt with brown stripes. Mackey matched his stare intently. Broussard’s testimony is expected to continue Monday afternoon.